The aggressive fire broke out around 1 AM PT on Thursday. A nearby resident said he saw the first flames, "There was a bunch of fire trucks driving by me," he said. 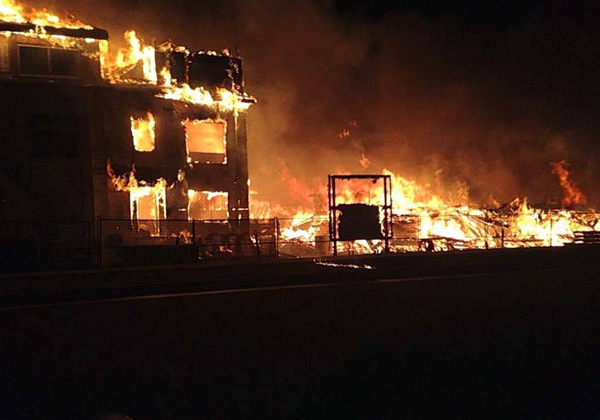 "When I looked over at the complex next to me, it was completely up in flames." The aggressive fire made quick work of the townhouse complex. The construction site is right behind a church and a car dealership. Fire officials said no one was injured, although around 30 people were temporarily displaced from surrounding homes as a safety precaution. Dozens of near by residents were displaced as this fire grow so hot it threatened neighboring buildings.They will be looking into what caused the fire later today. Authorities need to consider this 1am fire as just another arson attack like the Townhouses in NJ just last week is now known to be an arson fire they got it on film. We are now up to 25 of these fire under construction in the last 18 months. Builders need to do more than just fence these job sites. If the lumber was fire treated as the building was going vertical there would be much less loss.